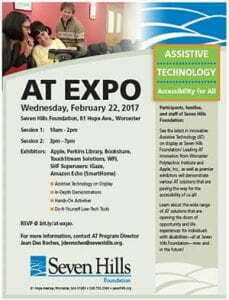 Welcome to the Seven Hills Assistive Technology Expo Page! Our Interactive Qualifying Project was to assist Seven Hills Foundation stay updated with the latest innovations in Assistive Technology. We decided to host an Expo to see if this was a good way to solve the problem, which ended up being true. To give Seven Hills our preparation steps and recommendations in regards to hosting an Expo, we created an online database to compile all of our information. Seven Hills Foundation is an integrated health and human services nonprofit organization. 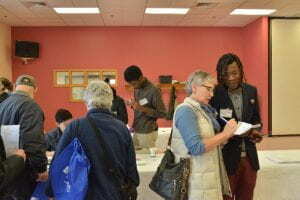 Through their integrated clinical, educational, and community-based supports led by their 3,700 employees, they help people ” SEE the possibilities, BELIEVE in themselves, and ACHIEVE their dreams.” Seven Hills Foundation has 160 locations throughout Massachusetts, Rhode Island, and seven countries abroad. Click here to proceed to their Website! From left to right: Steven Kessler, Jean Des Roches, Chau Tran, Anthony Vigliotta, Franklyn Bucknor, Nick Martin. Steven Kessler and Jean Des Roches are two of our wonderful sponsors in our Expo Team. Chau Tran, Anthony Vigliotta, Franklyn Bucknor, and Nick Martin are the student researchers for this project. 1. Research what previous AT Expos have accomplished. 2. Determine potential speakers and vendors. 3. Research and choose what hands-on AT activities could be included in the Expo. 4. Identify local and state resources available for carrying out an Expo if necessary. 5. Create a database that organized all the information we had gathered in the process of planning and hosting the pilot Expo. After completing the Expo, we evaluated how well an Expo would help Seven Hills achieve its larger goal of training and education. All of our recommendations that we gathered from this Expo will be included in the Database that we created.